I found very interesting antique news paper from India. 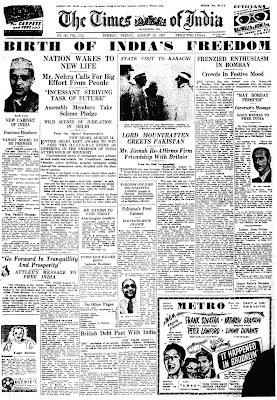 It is Times of india news paper on Aug 15 1947. Which is a Friday. The day India got Freedom - Indepencdence - Swaatantra etc. Really its so happy to see this, hope you all will enjoy seeing this. 7 comments to "News paper on Aug 15 1947 Times of India"